y que os colme el cielo de felicidad. "May God pay, gentle folks, your charity, and thus heaven heap happiness upon you." A perfect example of Mexico’s rich heritage is the elaborate, lively, and deeply spiritual way the people celebrate Christmas. Celebrations are centered around the close knit communities and families through out Mexico, Central America and southwestern U.S.A. Christmas, for people of Mexican heritage, is not two days of festivities and two months of mass commercial consumerism, like it is for much of North America. December 3rd is the beginning of the celebration of the Virgin of Guadalupe culminating on the final day of Dec. 12, the Virgin’s birthday. The Virgin of Guadalupe is revered as the patron saint of Mexico and the symbol of Mexican Independence. In 1531, the Holy Virgin appeared in a vision to a Nahuatl Indian, Juan Diego, on a hill top near Mexico City. A basilica was built on this very hill and instituted to the Virgin of Guadalupe. Pilgrims from all over the world visit theVirgin of Guadalupe Bacilica or other Virgin shrines to express their love and gratitude through the novena (a nine-day prayer series), calendas (religious processions), and joyous celebrations with feasts, music and fireworks. Devotion to the Virgin transcends cultural, religious and class structures. Also beginning Decmber 3rd is Chanukah: a time for Jewish people to remeber the Maccabees who regained control of the Holy Temple in Jerusalem. Many Jews have lived in Mexico and the desert southwest for centuries since their escape from the Spanish inquisition in Europe. For Chanuka, families light a candle on the menorah every day for eight days to symbolize the supply of concecrated oil the Maccabees had durring their seige. Chanuka is celebrated in Mexico in the same way as it is celebrated through out the world. After the end of the Virgin of Guadalupe celebration and beginning Dec. 16th is Las Posadas. 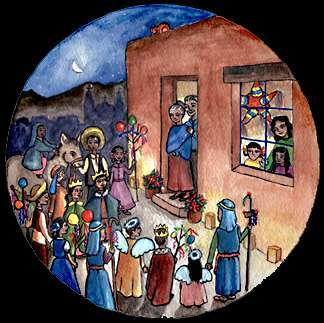 Las Posadas is nine days of childrens processions depicting the journey of the Virgin Mary and Saint Joseph to find shelter (posada) in Bethlehem. Children dress up as various santos peregrinos (holy pilgrims): Mary, Joseph, angels, Santos Reyes (the three kings), and pastoras (shepherds and shepherdesses). The procession of these santos peregrinos travels to three designated houses where they will sing traditional villancicos (carols) asking for shelter for the holy family. 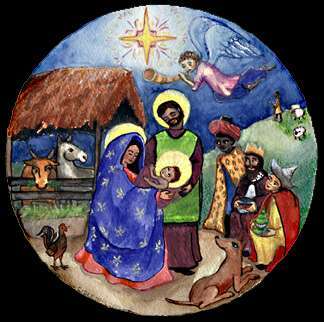 The procession is turned away by the first two houses but when they reach the third home they are invited inside to take refuge in the stable and what follows is a joyful fiesta. Once inside the home, children and adults alike partake in singing villancicos, the telling christmas stories through pastorelas (plays), admiring the Nacimiento (nativity scene) , breaking the piñata, eating christmas foods, and giving and recieving aguinaldo (presents). Las Posadas may seem steeped in christian roots but it is also equally reminicent of ancient native traditions. The dates of this holiday coincide with the nine days the Aztecs celebrated the birth of their sun god, Huitzilopchtli. Pastorelas derive from the real life historical reenactments of the Nahuatl people. Spanish missionaries took these origional customs and incorporated them into the christian holiday celebrations in order to convert the minds and hearts of the native peoples to Catholisism. The center of all these celebrations is Noche Buena (Christmas Eve). Late at night, families go to church for the Misa de Gallo (Rooster’s Mass). Afterwards, families go home for a Christmas supper usually consisting of tamales, pork or turkey, mole, and drinks like ponche (hot fruit punch) and sidra (cider). Besides a Nacimiento, the home may be decorated with La Flor de Noche Buena ( pointsettia ). Afterwards, children open gifts, play with luces de Belen (sparklers), and break the pinata. Christmas day is set aside for rest and quiet reflection. Mexicans have been known to challenge intimidating fears in a humorous manner, most notably their famous celebration of loved ones passed, the Los Dias De Muertos. There is another another example of the Mexicans intrepidness. Celebrated on December 28th, Dia De Inocentes (day of the Innocents) is akin to April fools day with a dark undelining. The custom recalls King Herods call to kill all newborn children in order to get rid of the Christ child. Mexicans have used King Herods unconcionable attitude and turned it into a light hearted jaust at friends and loved ones. On Dia de Inocentes it is common to play practical jokes, tell tall stories, and borrow things from others and not return them. Victims of these pranks are given gifts of sweets or toys in memory of Innocents lost to Herod. Año Viejo, or New Years, is ushered in with lots of noise and fireworks. This holiday is in contrast to the smaller family gatherings for Noche Buena. In small towns especially, the center square is filled with people dancing, eating and singing around bond fires. One tradition is to eat twelve grapes coinciding with each bell chime from the church bell tower in order to bring good luck for the next twelve months. Like Christmas day, New years day is quiet and subdued. Los Reyes Magos is much like a second Christmas for children. On January 6th, the same day as Epiphany, children find gifts for them left by the Reyes Magos (Maji). Mexican children don’t write to Santa Claus for presents, they send Reyes Magos and El Niño Dios (Christ child) their holiday wish list. A special sweet bread called Rosca de Reyes is made and indside the treat is planted a figiurine of a baby (or more). Whoever finds a baby in their piece of Rosca da Reyes is named a godparent of the Christ child and is responsible for hosting a party on February 2nd, El Dia de Candelaria (the Day of Purification), the final day of Christmas festivities. We hope you find these enriching celebrations inspiring and you may want to integrate some of these customs into your Christmas celebrations and deepen your knowledge of Mexican cultures. Provided here are some links to a wonderful and informative sites to further your interest in Mexican holidays.